Your FREE Android app, to approach scout world! 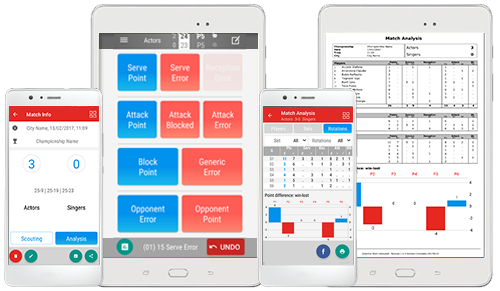 at the end of the rally, you can get a synthetic statistical analysis of great value, to better assess the performance of both yours and opponent teams. to scout. Essential Stats is available for all Android mobile devices: it's now possible to scout not only with a tablet, but also with your smartphone! with other Data Project scout software: you can export data on Click&Scout or Data Volley 4 or import a scout from them. the collected data: you can export the match report PDF and send it straight from your device. You can also post on Facebook the analysis, to let your friends know the results achieved. 1. 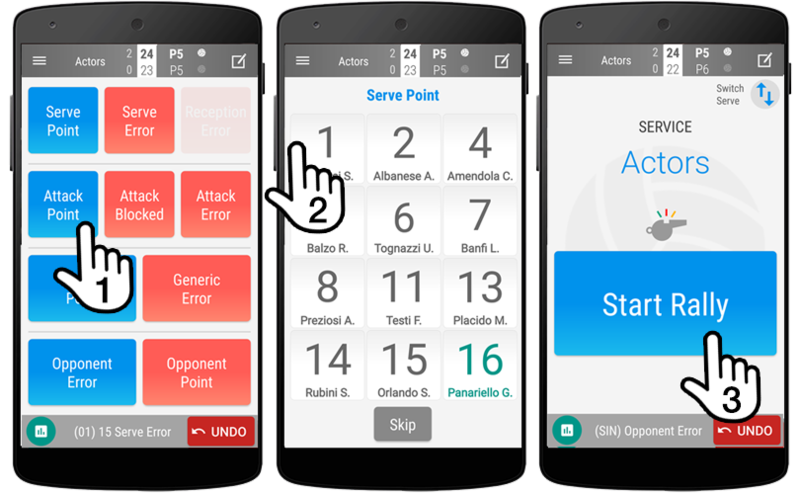 With a tap you register the result of every rally, to have at the end score analysis per set and per rotation. 2. 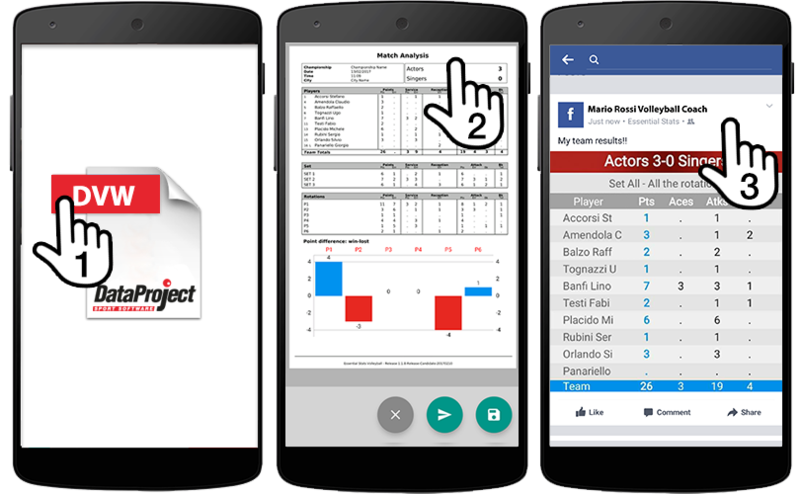 Relate the player to the rally result and get also scores analysis per player. 3. Scout the start of the rally, in order to synchronize the file to the video of the match with Data Video Essential. 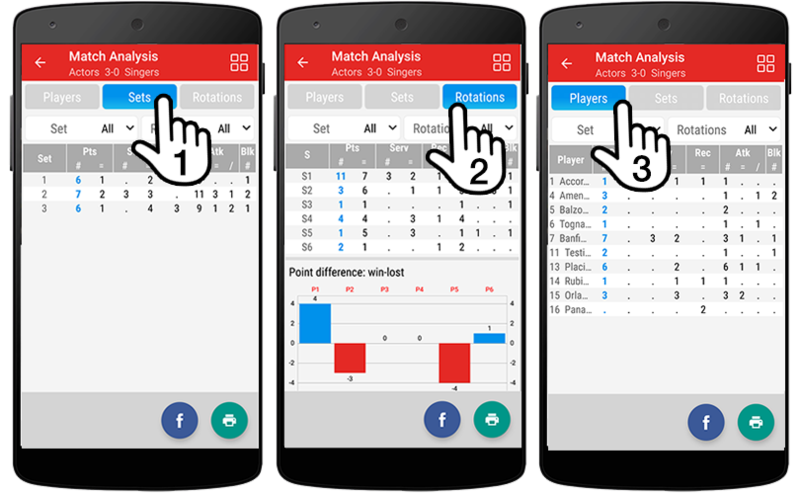 At the end of the match, you get the analysis per set(1), per rotation(2) and, if detected, of players(3). 1. Scout file Data Project standard format: export it on Click&Scout o Data Volley 4. 2. PDF: print the match report or share it with the team straight from your device via Whatsapp, email or any other tool that supports it. 3. Analysis file of players, sets or rotations, created for sharing on Facebook. Available for all Android mobile devices. 1 - How Can I dowload the App? 2 - Is There a Software version for iPhone, iPad or device with Windows OS? 3 - . Is it Possible to import a team or a match from another Data Project Software? 4 - Is It Possible to Export a team or a File Scout from Essential Stats? 5 - Is it possible to associate a File Scout with a Video? 6 - How Can I Syncronize an Essential Stats file with a Video? 7 - How can I LOG IN? 8 - Essential Stats shows me the following message: “Allow Essential Stats to access photos media and files on your devices?” What I have to do?